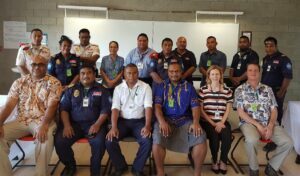 More than 15 personnel from various law enforcement agencies, the Tax Department and Senior officials from the ANZ Bank underwent a National Workshop on Financial Crime in Kiribati from 17 to 21 February 2019. 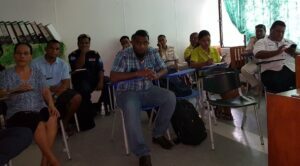 The training was conducted by OCO in collaboration with its law enforcement partner JIATF West. The overall aim of the workshop was to create awareness and understanding on the impact of llicit financial flows and the social harm it creates to national and regional economies. The training also highlighted the need for border agencies to work collaboratively with each other and encourage a free flow of information exchange. The training also highlighted how transnational organised crime and its related offenses, money laundering, currency smuggling, environmental crime, tax fraud have cross jurisdictional implications and necessitates inter agency as well as regional cooperation and collaboration to systematically address issues. Regional and national efforts must also be properly coordinated to combat illicit financial flows which has an adverse effect on livelihoods, social structures and governance of any economy. The training covered a range of topics which included: illicit financial flows, customs valuation, trade-based money laundering, money laundering, informal money transfer systems, risk management, legislative platforms and information sharing. OCO is working closely with its key partners in creating awareness on this continuous evolving security landscape.